Published on SoCal Indie Magazine. 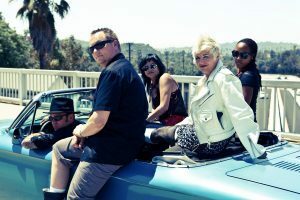 There’s something deeper behind the rock and roll lyrics of California-based indie band, Kittenhead, than a passion for music and self-expression. There lies a sense of responsibility to use the platform of the musical stage to be advocates for the disenfranchised and a voice in the movement for more social justice. DD, who plays guitar, bass, vocals, Kivi, who does vocals and lyrics, O-Face (Owen) who plays drums and percussion, and VJJ (Victorya), who plays bass, guitar and vocals, joined forces in May 2012 and played its first live shows in September 2012 in the Pacific Northwest, with a headlining slot at the Comet in Seattle. The band has since played all of the major cities on the West Coast and resides in the California Bay Area. Kivi had met DD after attending law school but not finding that working with in the profession of the legal system was the best way to promote social justice for her. Kivi and DD invited O-Face to join them and added VJJ after an audition, and together, the band continued to passionately use their art to make a difference. The band took this goal and quickly acquired growing success and recognition. In the fall of 2012 Kittenhead recorded their first EP, “Derby Girl,” which gained radio play for the title track. Today the track is currently the skate out music for Roller Derby Leagues around the world from the UK to Australia and across North and South America. Kittenhead followed up their successful EP with the full-length CD with Paul Roessler of Kitten Robot Studios called “We’re Here.” The first single, “Tinman,” which captures its audience and makes a social statement about the violence in society, is currently the single “#9” that is being played on The World Famous KROQ, by Rodney on the Roq, Mayor of the Sunset Strip and tastemaker par excellent. The song resonates with so many people because of its message, its relevance to the current political climate, and the song’s ability to open up dialogue and motive people to also become activists. There’s no doubt that this band is here to make a difference as they have proved their dedication to helping their fellow human whether it be playing benefit shows for cancer survivors, college scholarships, and animal rights organizations. The band is all about using their voice to enact change, create a positive impact on the world, and committing to help contribute to the efforts of other prominent activists alike in forming a better society. You can check out the band live at their upcoming show to release their new EP, with Frequency Within and Edgewater Angel at The Satellite in Silver Lake on Sunday, July 22nd at 8:00pm. You can also check out their song, “Tinman,” on Spotify.